I had been missing music in my life recently. Then, oh joy, our hi fi system was repaired, and all of a sudden, music flows over and around me again like balm, like electricity, like sustenance. Ludwig van Beethoven told us, "Music is the mediator between spiritual and sensual life." How right he was! For everyone, but, I suspect, especially for artists. I cannot count how many times I have read of artists or heard artists saying that they always create art to the sound of music. I find that the type of art I am trying to do dictates to some degree the music to which I listen. Gregorian chants or early choral music go beautifully with silverpoint drawing, while watercolours are far more eclectic! Life drawing too works marvellously to world music with a driving beat. Different kinds of music, different rhythms. 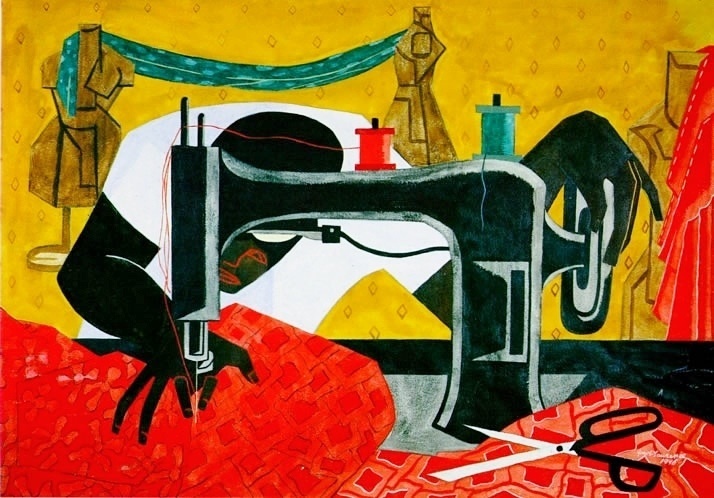 Think of two wonderful artists who depicted music-making but who themselves made art that pulsed with rhythm - Romare Bearden and Jacob Lawrence. Each of these amazing artists leaves an impression that they were marrying the music they heard with the images they saw in their mind's eye. 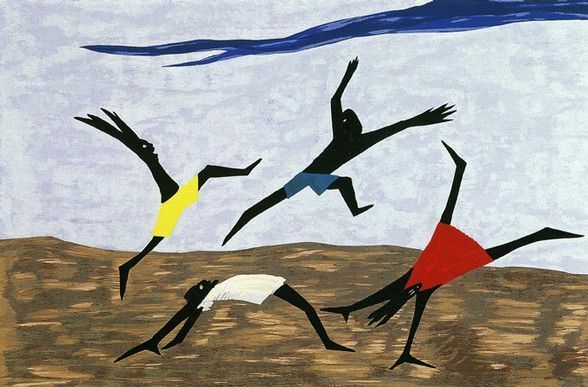 Just as Alton S. Tobey described as he wrote, "There is a kinship between music and painting - with the same words used to describe both, as when a musical composition is said to have colour and a painting to have rhythm." Indeed, for me, music is art in real time, art is music in real time - but oh, it is nice to have the opportunity to marry both together again. The mysterious process of creating art never ceases to interest and amaze me. An artist's adaptability to circumstances is a vital ingredient in this mix, and one that tests the seriousness of resolve to create. 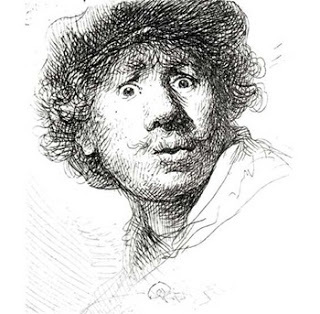 Somehow this self-portrait by Rembrandt expresses some of what I am trying to say. Depending on the circumstances, an artist can find totally different sources of ideas and inspirations for art. A simple example is when one is working plein air, versus working in one's studio and relying on very different sources than the outside world. I did both of these pieces of art when I was working on Sapelo Island, one of the magical Georgia barrier islands fronting the Atlantic Ocean. They were done almost in reaction to that small voice inside my head, saying 'this is a scene which could be the source of a painting or drawing'. Of course, once that decision is made, then comes the endless actions, reactions and alterations that are part of my art-making. Working in the wind and sun, with changing conditions, an artist adapts according to the moment, trying to push through on the original idea and inspiration, and yet trying, at the same time, to end up with a respectable piece of art. Incidentally, both watercolour and metalpoint are rather unforgiving media for changes and alterations, especially when drawing in different metals (silver, gold, copper, etc.). It makes for interesting, if not challenging moments during the process of art-making! 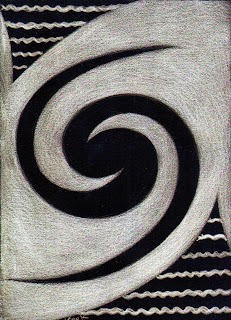 By contrast to the concepts and reactions to working outdoors, en situ, there is the work in the studio, when an artist can draw inspiration from a myriad sources, in the head, from ideas derived from the wide world outside, from music, from reading, from films or television, from one's family and its history, from politics... an endless reserve of triggers that suddenly spark an idea for a piece of art. In some ways, the work created in the studio is far more controllable, even if it is complex to execute. Normally, you don't have to battle the weather, light constraints, travel, insects, etc. that you encounter often outside. Perhaps the only "constraint" in the studio is cultivating what Paul Cézanne talked of: "genius is the ability to renew one's emotions in daily experience". You have to keep fresh, alive, thinking and reacting, to find that springboard to a new venture in art creation. How that trigger comes is often, to me, totally mysterious, but again, I find that that mysterious small voice at the back of the head speaks when one least expects it. Ironing, day-dreaming, a walk - meditative, repetitive jobs all help. Dare yourself to try another medium, another voice, another subject that you have not embraced before. Even an idea that is not perhaps initially the most inspired can evolve and become something special, something significant. Whilst sustained hard work can yield results, there are times when other considerations in life - family, illness or whatever - have to be factored in. In those cases, creating art can go on, even if only in your head, for a while. Allow yourself to follow different work rhythms at those times, for ultimately, you will get back to inspiration and art-making, perhaps with added depth and ideas. These were two drawings I created in the studio, long after I had returned from an art residency in South Italy. The seeds were sown there, the inspiration came later when I was looking back at drawing books and notes I had made there. Inspiration comes in such magically mysterious ways, often by different routes, but every artist becomes attuned to his or her paths to art-making. Trusting one's inner voice, believing in oneself and keeping one's antennae up high are all ingredients in these mysteries. While listening to the BBC World Service on the radio today, I heard an interesting interview on The Strand programme with South African composer Kevin Volans. He was discussing the multiple influences on him and sources of inspiration for his compositions. He made the remark that a musician needs to have his ears open at all times to all the sounds around him, because he is thus "fed" and inspired - I am paraphrasing. I thought it was the perfect reminder to me, as a visual artist, that artists' antennae should be up at all times, our eyes open and registering actively and our senses receptive to the world around. No one ever really knows what will stimulate some new creative idea – that is perhaps what makes being an artist so endlessly interesting and exciting. Volans was talking of living in South Africa and listening to Zulu being spoken on the street all around him. When he went to Germany and heard German being spoken, it made him very aware of the differences in sound and in fact, drove home to him his links to Africa. I relate to that statement, because I grew up with melodic Kiswahili being spoken all around me, and somehow those sounds still mingle with brilliant African light and tropical colour in my mind. Antennae, for artists, don't just register visually; rather, we all should be aware of sounds, light, colour, motion or stillness – the world around us in multi-dimensional form. Sharpening one's powers of observation always brings rewards, because whatever the artist is seeking to create comes across more powerfully and authentically when there is knowledge behind the creation. 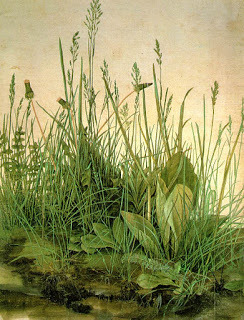 Dürer painted this study in watercolour in 1523, many years after he painted the turf, but he was still looking very carefully at nature. 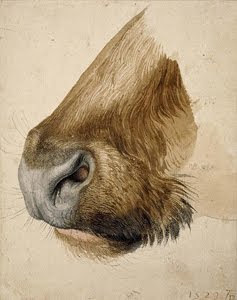 In fact, Albrecht Dürer was so noted for his studies of plants and animals that in the years after his death in 1528, those were the aspects of his art that were most admired and emulated by fellow artists and subsequent generations of artists. Perhaps part of being an artist, in any discipline, is to have one's eyes and ears really working. Certainly all the great artists confirm the need for these well-honed antennae. It is interesting how a beautiful place like Sapelo Island inspires one to do so many different types of art. Now that I have been able to look again at the work I produced last weekend on the Island as Artist-in-Residence, I realise that I managed to produce some very different pieces, ranging all over the place in subject matter and in approach. It reminds me how one responds to places and situations in such varied ways. There seems, certainly in my case, to be some unspoken dialogue that goes on subliminally between what one's eyes are seeing and what one instinctively senses could become a drawing or a painting. It is almost beyond cogent thought. You just "know" that that will be a subject worth trying to tackle. It usually ends up humbling one, resulting in a somewhat different result that one visualised... in essence, the subject dictates the whole process. Scouting for possible subject matter is always initially instinctive. Only after one has decided that there is something there to be explored does one try to analyse what exact medium to use and how to go about actually physically doing the artwork. Often this whole process is rapid, because when working plein air, you know that the whole thing is fleeting. Light will change, the tide will alter, the birds will fly off, people might come along to fill the empty scene or whatever. 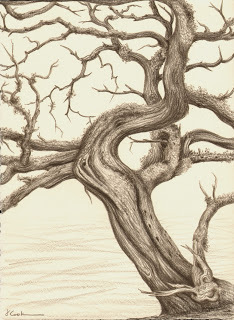 In any case, I found so many things of fascination to try and draw or paint. These three drawings I am posting are just examples. 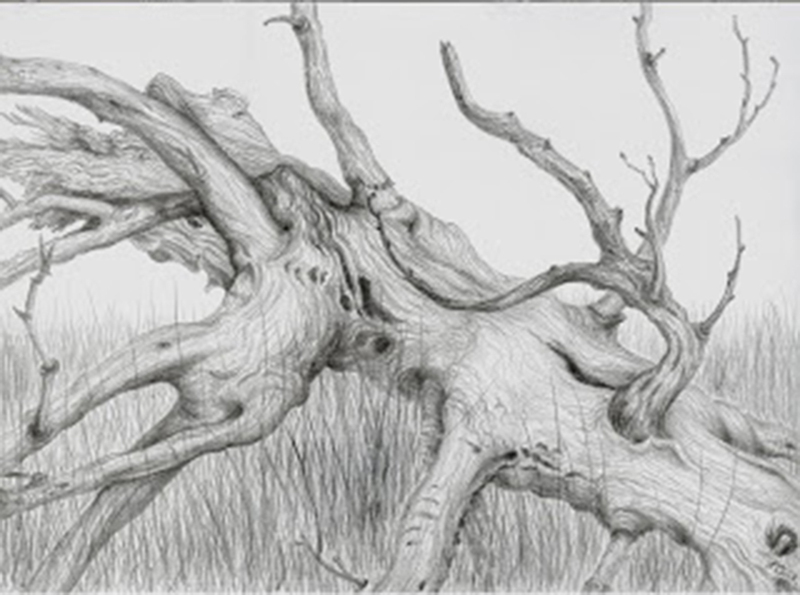 The Cedar Tree posted above, in silverpoint, was the crown of a huge old tree that had been blown down many years ago and was lying, burnished and reduced to its core, in deep marsh grasses. 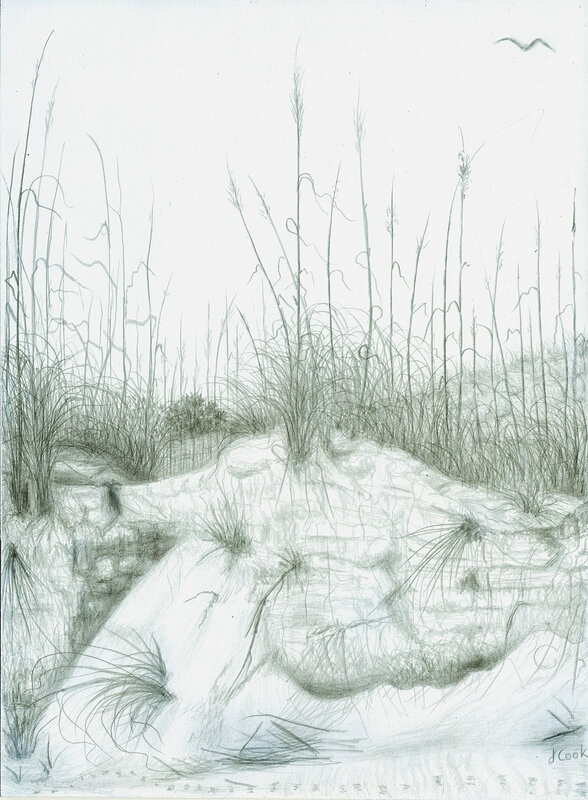 Sapelo Dunes was an early morning silverpoint study of the different parts of the dunes facing the restless waves that aided the wind to shape these dunes. Holding the sand against these forces, the sea oats cling tenaciously, their roots amazingly long and lying exposed at the eroded face of the dunes. 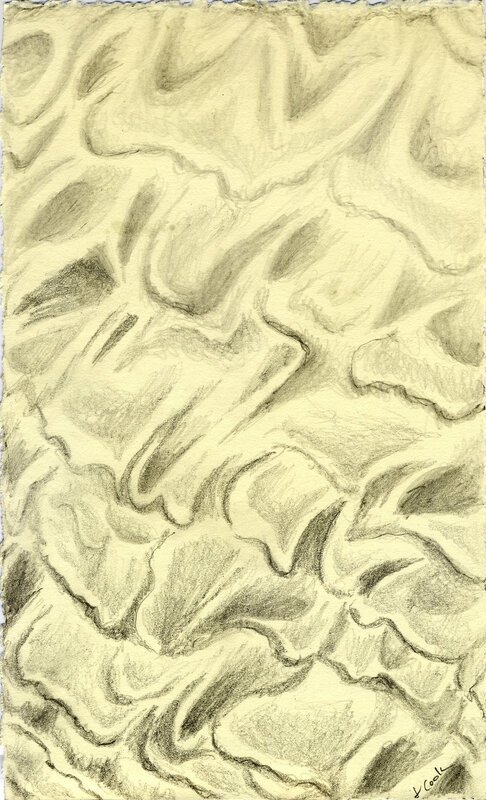 The third drawing is a graphite drawing done as the sun was setting on the wide sweep of low-tide beach, the light glinting on the marvellous ridges left in the sand by the water's motion. I was racing the light and only had a very short time before darkness fell. No time for thought, just a fascination to try and make something of nature's marvellous complexity in Low Tide Tracery. A short article on an upcoming exhibition, "Rachel Whitehead Drawings", at the Hammer Museum in Los Angeles, gave an insight into artists' habits which rang bells with me. The article, "Allegra Pesenti", (the exhibit's curator), appeared in January's issue of Art+Auction. 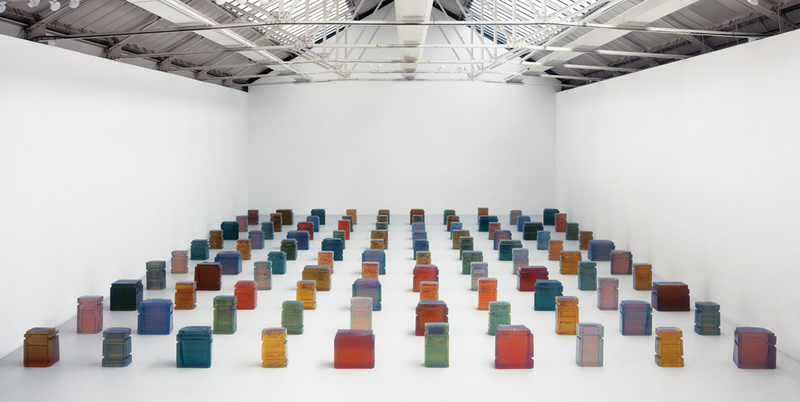 It described how Rachel Whitehead, principally known for her resin cast sculptures, also has always had a concurrent creative activity, her drawing. That seems hardly surprising as drawing is so often the underpinning of any creative conception - the mere act of drawing out possibilities and forms helps define what one is trying to say, in no matter what media. The much more fascinating aspect of this curated exhibition, which travels later to the Dasher Sculpture Center in Dallas and finally to the Tate Britain, is Whiteheads's collection of found objects. She, like so many of us artists, is apparently a collector of sticks, stones and oddments that range from dental casts to shoe stretchers. 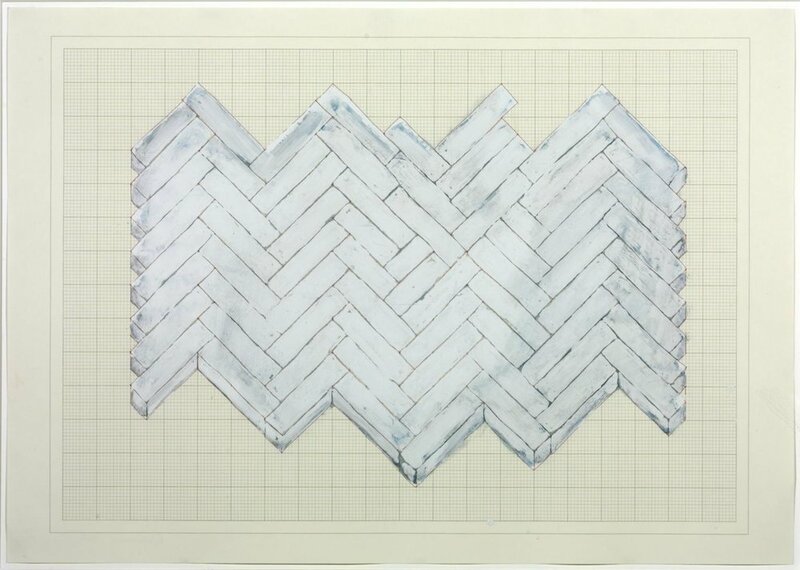 She considers them sketchbooks parallel and complementary to her drawings. I learned the joys of collecting stones and shells from the time I could walk, along the dazzlingly white - and in those days, deserted - beaches of Kenya and Tanzania. With the boom of surf beating on the distant reefs, the treasures to be found on the pristine sands were amazingly beautiful, not only for the diversity of tropical shells, but also for the reminders of long history, in the blue and white shards of early Chinese pottery and porcelain. Dhows, plying the Indian Ocean through millennia of trade winds, connected China and the Far East to India, the Middle East and East Africa: broken dishes used on the vessels would be thrown overboard. These beautiful shards have been one of my treasures, and I found a way to include them in one silverpoint and watercolour drawing I did some while ago. 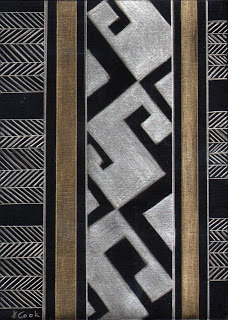 "Three Generations - Braided Memories" used designs from the Chinese shards. This was but the first of my many, many collections of found objects that I keep squirreled away. In the due and right time, they will become part of the creative process, I have learned. I know that many of my artists friends are inveterate pack rats too, but it is interesting that someone known mainly for her sculpture regards her collected objects as vital parts of her drawing activities. Good for Rachel Whitehead! I find that inspiration from music comes at all sorts of unexpected moments. 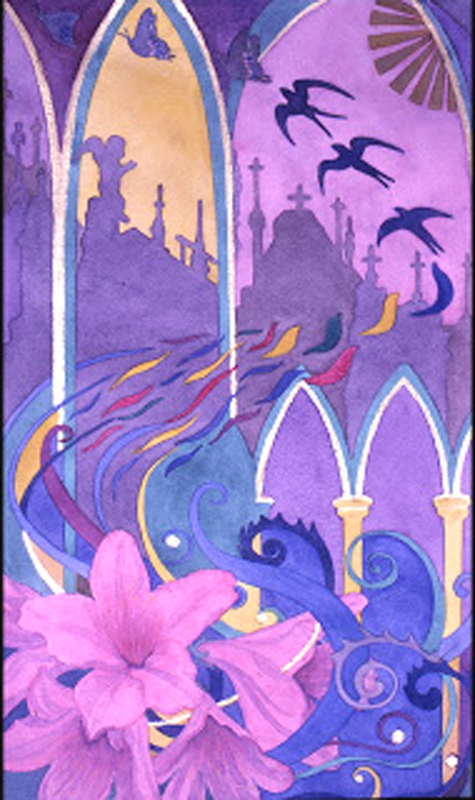 This watercolour painting, "Palestrina at St. John's Cathedral", came about one spring because I was lucky enough to go to a wonderful concert by the Tallis Singers in St. John's Cathedral, Savannah, Georgia, during the Savannah Music Festival (http://savannahmusicfestival.org). While I sat listening to ethereal notes of Palestrina, I found myself composing this painting, based on the beautiful polychrome interior of the Cathedral. Inspiration occurs in the other direction too, of course. Just this last weekend, February 21-22, 2009, in the Leisure & Arts section of The Wall Street Journal, Morten Lauridsen wrote a fascinating description of how Francisco deZurbaran's "Still Life with Lemons, Oranges and a Rose" (www.nortonsimon.org) was the inspiration for his composition, "O Magnum Mysterium". The intensity of feeling conveyed by the lemons, oranges, orange blossom, single rose and fine china cup depicted against the dark background, together with their eloquent placement on the table, helped Lauridsen define what he wanted to say in his musical composition. It is an article well-worth seeking out for its insights into how one form of art allows for great inspiration and creativity in another form of art.